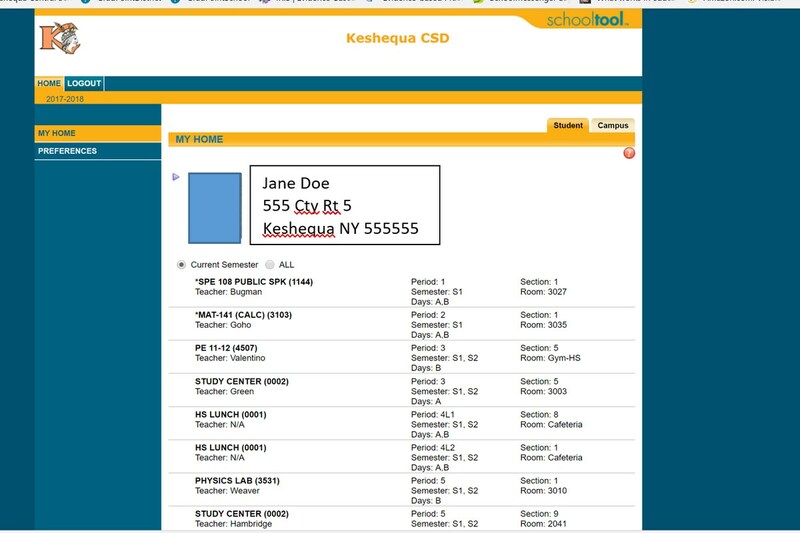 This page will give parent access to various portions of our "SchoolTool" student management database. In it you will be able to check your student's schedule, their grades and assignments, and have access to contacting their teachers. If you already have an account, click on the link below to get started. If you don't have an account, click on the staff link and email Mrs. Marnie Hillier to request an account. You will need a valid email address to set your account up. Your in the box labeled 'USERNAME' simply type the email address you supplied when requesting your account. In the box labeled 'PASSWORD' type the auto-generated password you received in the email that stated your account was created. Doing so will bring you to a screen with a picture of your student (s) and their schedule (s). We've used a blue box in place of the student picture in our example below. You may expand your student's information by clicking the blue triangle next to their picture. Doing so will bring you to a screen which will allow you to view our current emergency contact information for your student as well as access tabs that will give you the opportunity to view their schedule, grades, and assignments. Please contact the Intermediate/Secondary School Main Office for any questions or accessibly issues you are experiencing.